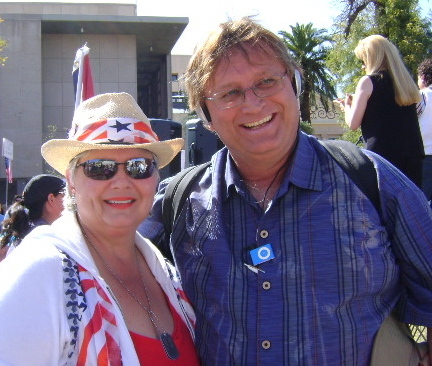 Phoenix Tea Party - Love those Arizona Patriots! Hi everyone! I’m on the Tea Party Express III tour rolling along in “The Blue Bus”, one of three buses caravaning across the country to bring the message of REAL hope and change to Americans across the fruited plain. My show producer Dave Logan has been doing a great job keeping you up to date about the Tea Party Express III tour. Right now it’s almost ten ayem we’ve just left Flagstaff AZ heading out for a 600 mile trip to St. George, Utah. We’ll do one Tea Party Rally there today. I will be updating with newer blogs as often as possible, so please keep checking back. Today we were in Phoenix and Flagstaff, meeting with the good people of Arizona who are fed up with the machinations in Washington, and especially fed up with their Senator John McCain. Just vote them out! Norman Huckaby, brother of Nathan of Orlando (a longtime listener of my radio show), came out to say "hey!" on behalf of himself and brother Nathan. J.D. Hayworth, aims to retire John McCain from his Senate seat. In the hotly contested race for the US Senate seat currently held by my favorite RINO Maverick and yours (I jest), candidates J.D. Hayworth and Bob Deakin stepped up to the stage to say a few words. Eighty degrees and sunny — a perfect day for a a rally. Thank you Phoenix! We love you! Norman Huckaby, brother of Nathan of Orlando (a longtime listener of my radio show), came out to say “hey!” on behalf of himself and brother Nathan. Later that day, we rolled into Flagstaff at the top of a mountain. We went from 80 degree temperatures to 45 degrees when we arrived at Flagstaff. A hotel ballroom filled with Tea Party patriots awaited. Wonderful folks, all! The rally was livestreamed — the first one streamed in its entirety so far for the tour. Big news! The Tea party Express III is now streaming live, covering as many of the rallies as possible. William and Selena Owens and their team are producing and bringing the Tea Party to you live and on demand. You can register to join the party here. You guys should figure out a route across America in the ” Shape of the Liberty Bell ” ? I love that part of the country. The Grand Canyon, Zion, Bryce Canyon and lots of other impressive scenery. And if you have the time to look, archaeological sites all over the place. Am with you in Spirit. Praying lots for the return of our Nation to its Christian Roots.